Here is a record of everything with Samuel Hansen and I from the week Samuel came to visit me in the UK in November 2010. Chronological order of recording. Ish. 1. Math/Maths Podcast Episode 22 – LIVE from MathsJam! (13/11/10; Stone, Staffs. ; audio, 41:44). Math/Maths Live recording at MathsJam on Saturday 13th November 2010. A special episode with no news but views from the floor at MathsJam. Special guests this week (who gave their names): Colin Wright, Rob Eastaway, Bubblz the Mathematical Clown, Hugh Hunt, Dan Hagon, Jeff Morley, Timandra Harkness, Alex Bellos, James Grime, Phil Ramsden, Andrew Jeffery, Colin Graham and Sara Santos. 2. Combinations and Permutations Episode 57: LIVE, with audium! (13-14/11/10; Stone, Staffs. ; audio, 36:23). Samuel hosted and Peter appeared as a guest with Matt Parker and James Grime in this episode of Samuel’s (doesn’t mind its language) podcast, Combinations and Permutations. 3. James Grime’s The Mathematics of Bell Ringing (14/11/10; Stone, Staffs. ; video, 3:59). 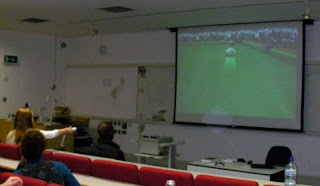 Peter appeared in this video by James Grime recorded in a quiet corner at the end of MathsJam. 4. The Math/Maths Computing History Tour of Nottingham – Burroughs and Ada Lovelace (16/11/10; Nottingham; video, 6:49). Nottingham is the burial place of the Byron family and particularly Ada Lovelace, regarded as the world’s first computer programmer, who worked with Charles Babbage on his Difference and Analytical Engines. Nottingham was also the overseas manufacturing plant for Burroughs Adding Machine Company, a precursor of modern computers, which became one of the eight major United States computer companies and ultimately joined a merger to form worldwide IT brand Unisys. When Samuel Hansen visited Peter Rowlett in Nottingham, Peter took Samuel on a mathematics and computing history tour of the city. In this video, Peter shows Samuel some of the sites related to this story in Nottingham, following a clue from David Singmaster’s Mathematical Gazetteer of the British Isles, and Samuel tells Peter some of the relevant history of computing. 5. Math/Maths History Tour of Nottingham – George Green: Miller, Mathematician, and Physicist (16/11/10; Nottingham; video, 12:03). George Green (1793-1841) was a miller in Sneinton, Nottingham who worked in his spare time to develop mathematics that, although unrecognised in his own lifetime, has been very useful to mathematics since. His work was rediscovered by Lord Kelvin and applied first to electromagnetism, later even to Nobel Prize-winning work in quantum theory, and continues to be useful to physicists and mathematicians today. When Samuel Hansen visited Peter Rowlett in Nottingham, Peter took Samuel on a mathematics and computing history tour of the city. In this video, Peter takes Samuel to visit some of the sites from Green’s life in Nottingham, including Green’s windmill, Nottingham’s mathematical playground, Nottingham High School and the Bromley House Library. 6. Math/Maths History Tour of Nottingham – When Einstein came to town (16/11/10; Nottingham; video; 4:14). Albert Einstein visited Nottingham in 1930 to give a lecture on his new theories of relativity at University College, Nottingham. The blackboard he used was varnished over and preserved, and a scrapbook of newspaper clippings is full of stories. When Samuel Hansen visited Peter Rowlett in Nottingham, Peter took Samuel on a mathematics and computing history tour of the city. In this video, Peter takes Samuel to the School of Physics and Astronomy at the University of Nottingham to see Einstein’s blackboard and find out what happened when Einstein came to town. 7. 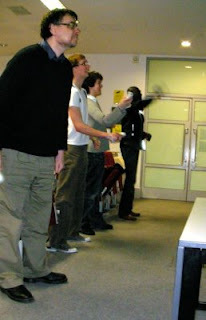 Math/Maths History Tour of Nottingham – George Green’s Slide (16/11/10; Nottingham; video; 0:10). Just a silly video in which Samuel and Peter take a trip down the pi slide in the Mathematical Playground at George Green’s Mill. 8. Math/Maths Podcast Episode 23 – LIVE from Greenwich (17/11/10; Greenwich; audio, 41:28). This episode recorded live at the University of Greenwich. This week Samuel and Peter spoke about: Android phone solves Rubik’s cube in 12.5 seconds; Edmonton Eulers; Relativistic trading; American math achievement; Russian maths problem teaches students who’s really in power; NASA’s Metric Failure; quantum error threshold; Top Five Utterly Incomprehensible Mathematics Titles; Your own maths theorem for £15; and news & stories (including stories from MathsJam) from the floor at Greenwich. Special guests this week: Mitch Keller, Tony Mann, David Singmaster, Nic Mortimer and Noel-Ann Bradshaw. 9. Math/Maths Live at Greenwich bootleg recording by James Clare (17/11/10; Greenwich; video: 08:21). Video recording made by audience member James Clare of first 8 minutes of the Math/Maths Podcast recording at Greenwich. Samuel Hansen’s visit to the UK and associated activities were supported by: University of Nevada, Las Vegas, University of Greenwich, University of Leicester Mathsoc, Nottingham Trent University, MathsJam, Nottingham High School, Bromley House Library and the Institute of Mathematics and its Applications. We are grateful also to the School of Physics and Astronomy at the University of Nottingham for letting us film there. You were promised a monster truck rally, a fight, an intervention, a sci-fi battle and a miracle cure. To find out what really happened on Wednesday 17th November 2010 at the University of Greenwich, you can listen to the Math/Maths Podcast Live from Greenwich! 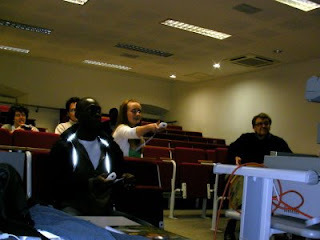 Yesterday I took the Wii to the Mathsoc at the University of Greenwich. 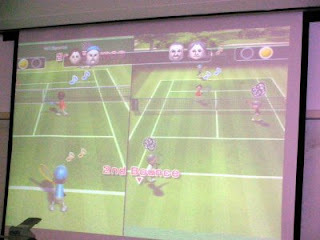 I gave a talk on spin in the ball games pool, golf and tennis and then the students played pool and tennis on the Wii. I think everyone had a good time and hopefully it raised or reinforced their awareness of the IMA. It was a good evening, anyhow. Some pictures follow. What do mathematics graduates do? And what skills do employers think they lack? This talk will highlight some of the broad range of careers options for mathematics graduates and point to several sources of career inspiration. Following this is information on the skills a maths degree gives you and those it perhaps does not. Looking at what skills employers think mathematics graduates lack will help you in finding a job – when you sit down in a job interview, what skills is the person opposite you expecting that you lack? Being able to surprise them may just get you the job! The talk rounds off with a look at the benefits of professional membership and some information about the Institute of Mathematics and its Applications.